Our Saint Patrick’s Day episode of Tuesdays on the Run with Patty from My No-Guilt Life and Erika from MCM Mama Runs and yours truly brings you the timely topic of race lucky charms and rituals. My pre-race ritual consists of getting nervous and pacing a lot. Maybe I need a good luck ritual or lucky charm to give me pre-race confidence, so share yours! 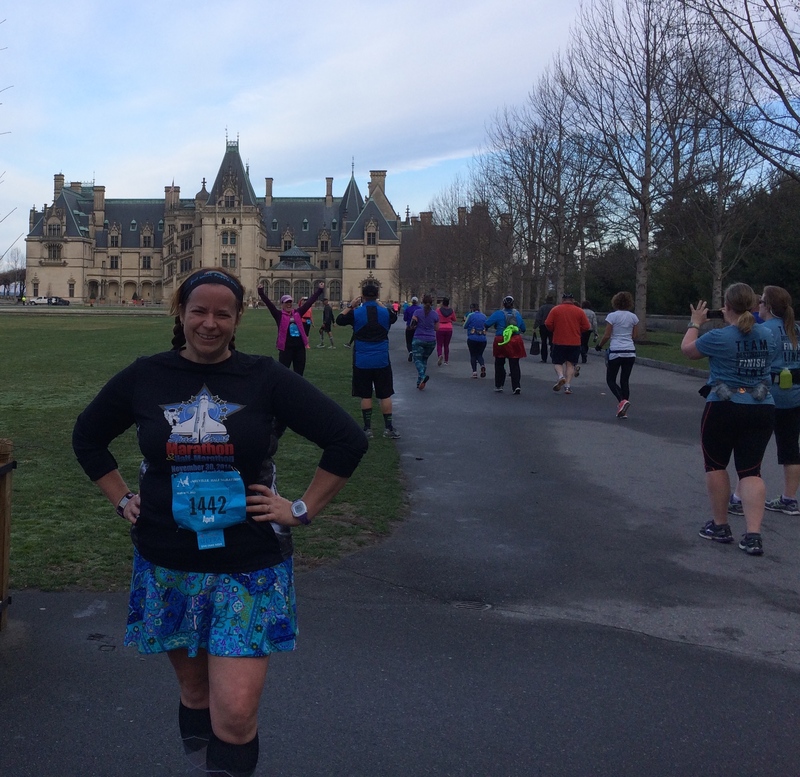 In the mean time, I wanted to share my race recap of last weekend’s Asheville Half Marathon. It sure was a crazy weekend and I’m still exhausted! On Friday, I got up early and picked up a rental car (I scored a BRAND NEW Nissan Altima!) at the airport and headed out for an eight hour drive to Asheville. There were some crazy things along the way. First, there was a huge boat that got overturned on I-95 South (the opposite direction from me) which backed traffic up on that side for miles and miles. Then I stopped at a McDonalds (I know, yuck!) in Georgia which had three chickens and a rooster wandering around the parking lot. At the rest stop in South Carolina, I was the only adult without a cigarette. Finally, through the weirdness and the perpetual rain, I made it to the hotel in Asheville. I was staying with two running friends from Georgia and they were already checked in and so we headed right out to pick up dinner. They suggested a nice Mexican place within walking distance which was really delicious and very Asheville-crunchy-groovy (no insult, I love that feel). You could choose to “donate” your side dish(es) to charity instead of getting them which was an interesting idea. I had some great sangria and enchiladas. We stayed at the Hilton Doubletree at Biltmore Village and it was very nice, especially the beds. No fridge in the rooms, which was a bit inconvenient, but there was a TGIFridays in the lobby which would have been great if I’d been traveling alone. The race expo was also at the hotel which was perfect. 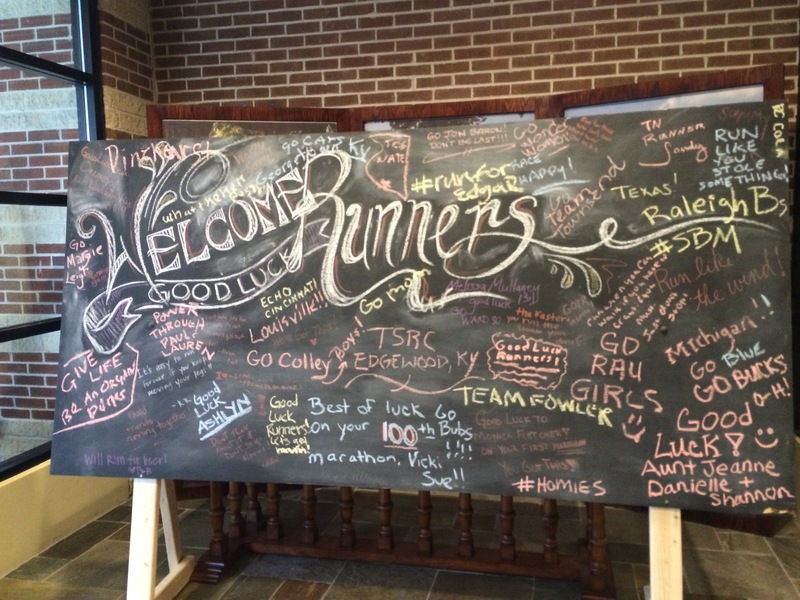 They had some chalkboards set up in the entrance to the hotel to welcome the runners! I slept surprisingly well both nights, I really think it was because I was exhausted and because the beds were so comfy! On Saturday, we headed down to the Expo around 9am to get started setting up (I was working the Bondiband booth). The expo opened at 11am and it was crazy busy for the next six hours. I think I sat down for just 5 minutes of that time (if that!) and only took a couple of bites of a sandwich. Not the best prep for a half marathon the next day!! After the crazy expo, we went looking for a dinner spot. We ended up at a really awesome place called the Village Wayside Bar & Grill. It had delicious burgers and sweet potato puffs. I had them put their signature Cheerwine BBQ sauce on the burger with some havarti cheese and it was divine. 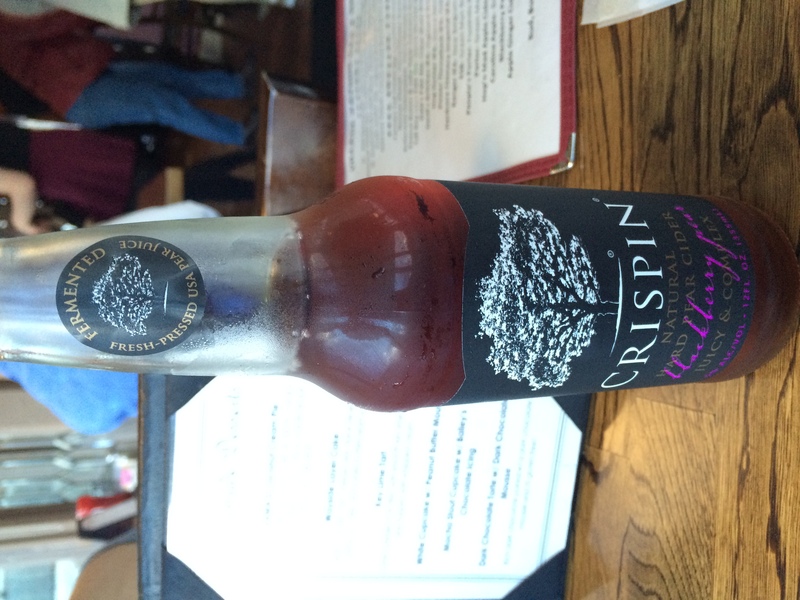 And they had tons of local beers, but I don’t like beer (I know, I know) so I got this instead. Yum!! After that very satisfying dinner, we tucked in for the night. I was concerned because the whole time I was there it was drizzly and chilly and I wasn’t really prepared for a cold and wet race. I was worried that the forecast for race day (dry and in the upper 50’s and lower 60’s) wasn’t going to pan out. We got up around 5am and got ready to head to the race. 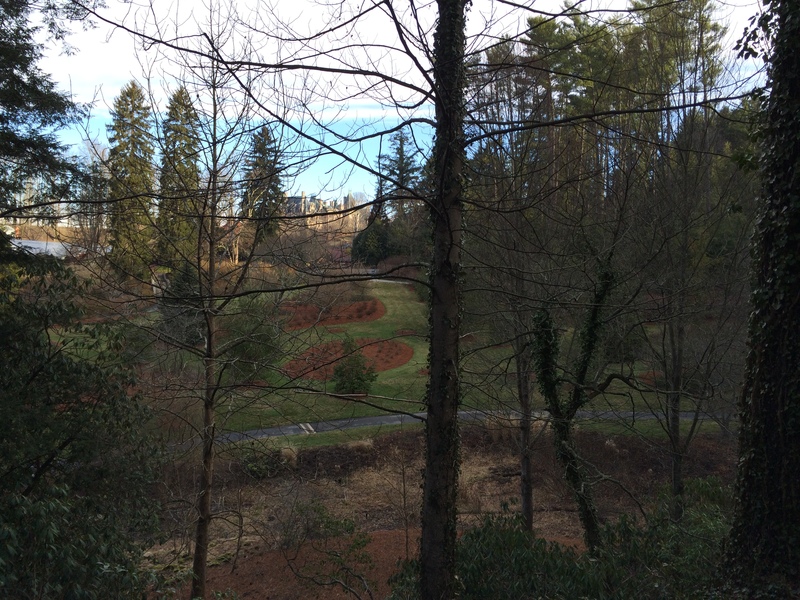 The hotel was just 1/4 mile from the entrance to the Biltmore Estate, but once you get in, it’s quite a drive to the actual estate. Here’s where I have to admit that I was less than enthusiastic about the race. My throat was hurting (I still have no idea why, maybe too much talking to customers at the expo?) and I was exhausted from the eight-hour drive and the full day of working the expo. I had only run once since Gasparilla weekend (three weeks ago) because of being sick. I’d only gotten up to ten miles in training and that was before Gasparilla! I was facing another eight-hour drive home after the race. Honestly, I seriously considered just getting in the car that morning and hitting the road. Instead, I drove to the Biltmore. I got there around 6:00 and sat in the car because it was a bit chilly (but dry!) and I needed to charge my iPhone! I used that time to continue to think about the benefits of driving home right then. I’d get hours of driving done before traffic picked up. I wouldn’t have to worry about missing the rental car return deadline. I wouldn’t have to die on the race course. All good things. 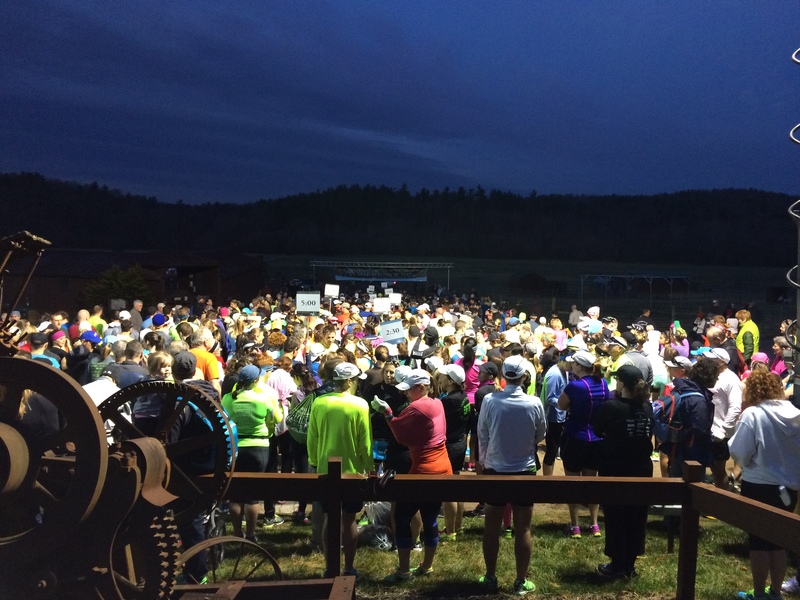 But, I talked myself into at least starting the race… It was nice to stay warm in the car, but it meant that the port-a-potty (and regular potty) lines were really long by the time I got to them. 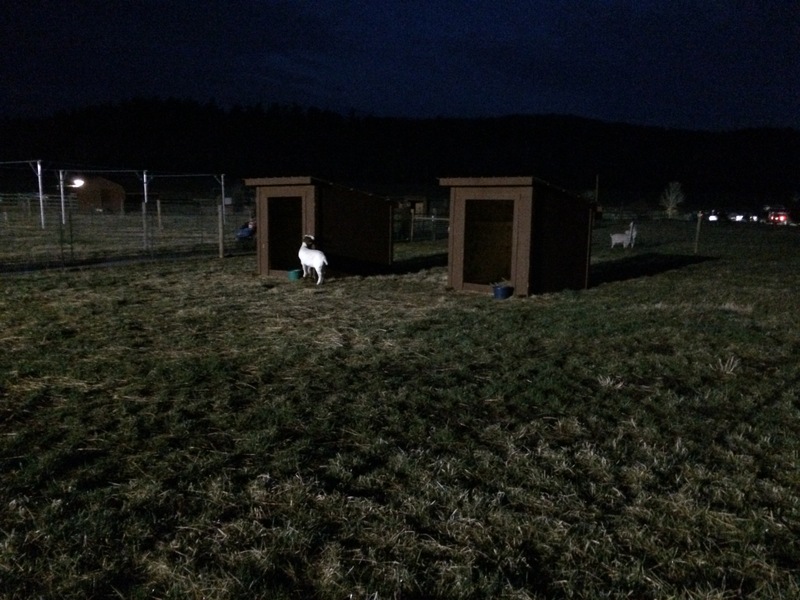 The start line was right next to the goat pen and chicken coop! 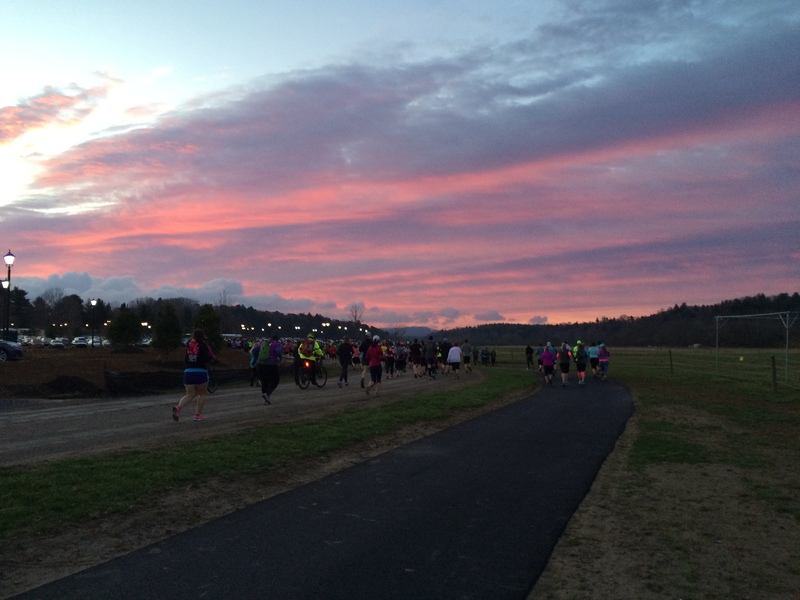 The race started at 7:30 right as the sun was rising. The donkeys seemed a bit confused about exactly what was going on! And we were off. 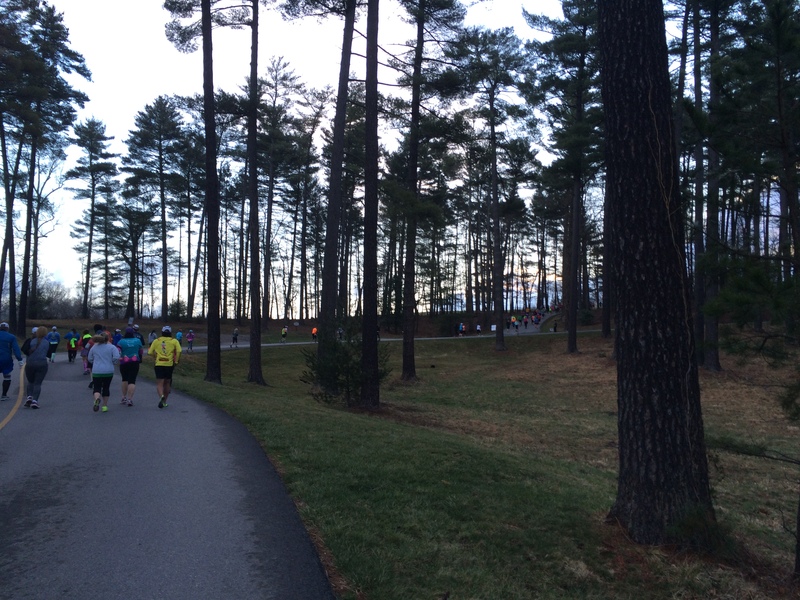 Based on my recollection the first half of the half marathon course is paved roads and is full of hills. 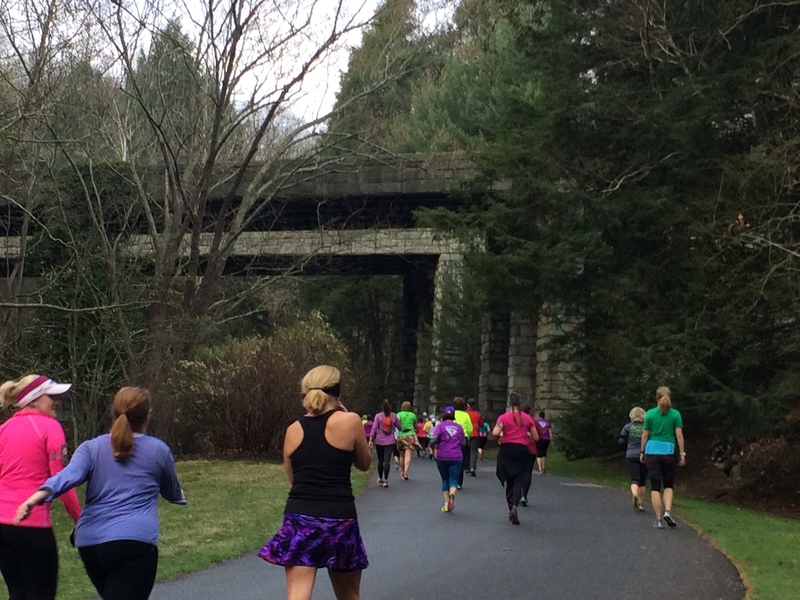 Big hills, small hills, uphills, downhills. Name a hill and this race had it. 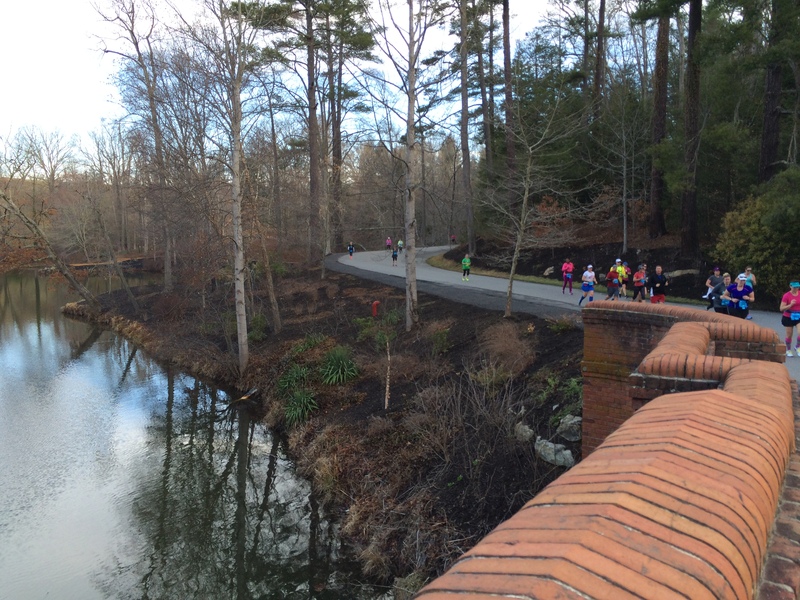 The good news is that after the first six miles, it was really quite flat (until the last 1/4 mile to the finish)! Yes, I SAW the elevation map, but I live in Florida, I have no idea how to read one of those. I assumed it meant there were some small hills, but nothing to worry about. And, for people who live in Asheville, or San Francisco, or Seattle, those probably are small hills, but not for this flatlander! I knew that the runners were supposed to make it to mile 7 by 9am (a little less than a 13 minute/mile pace) and I was freaking myself out that I wasn’t going to make it! I kept peering behind me to make sure there were still people behind me (I started near the back of the pack). I’m not sure that they actually pulled anyone from the course because there were lots of people behind me! 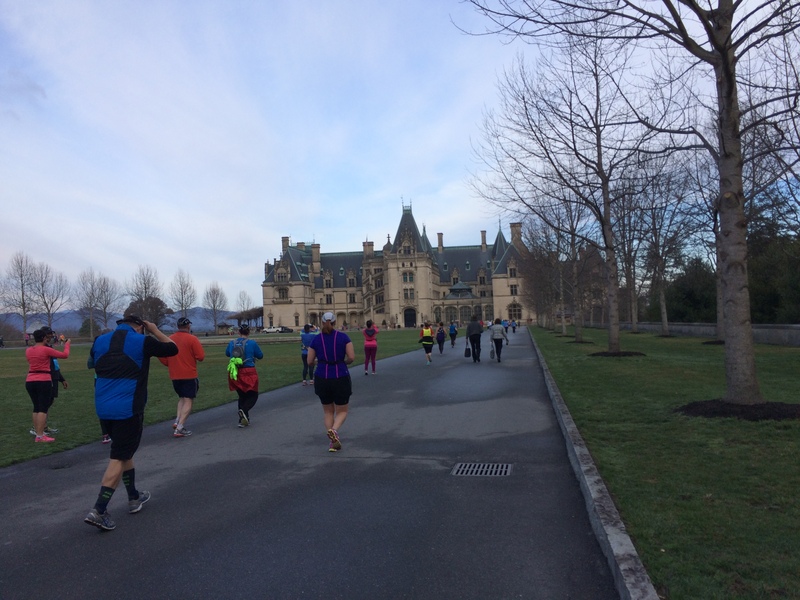 After that, we made it to the actual Biltmore house. It was just breathtaking! I can’t believe a family actually lived in such an amazing house! 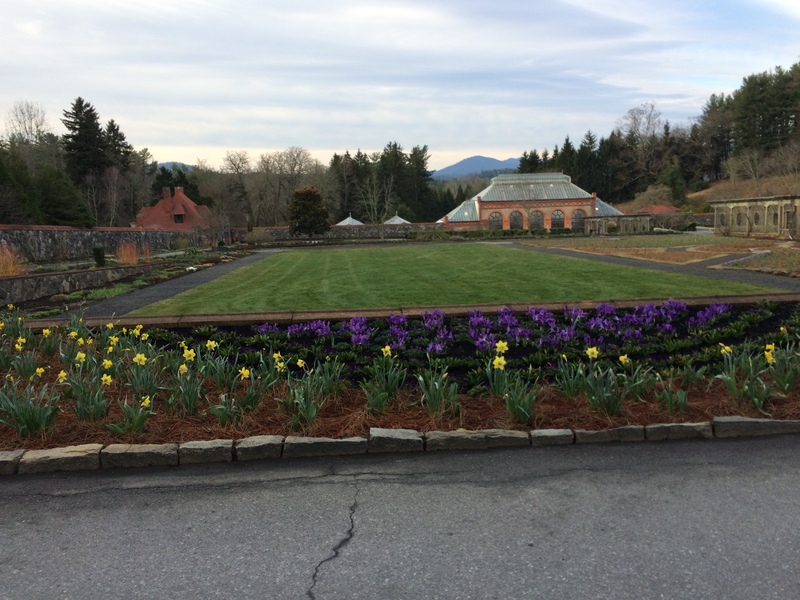 The formal gardens had some flowering bulbs and lovely views of the mountains in the distance. While the weather was chilly at the start, it warmed up enough that I was perfectly comfortable in a long sleeved tech shirt and even took off my gloves for a few miles. And it got nice and flat at this point which was a welcome relief to my legs! 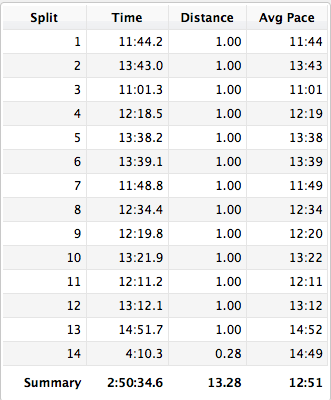 Once it got flat, I went back to my 5/1 intervals for most of the rest of the race. Every corner we turned brought new and different scenes. I just love these grounds and this was a great way to explore them. 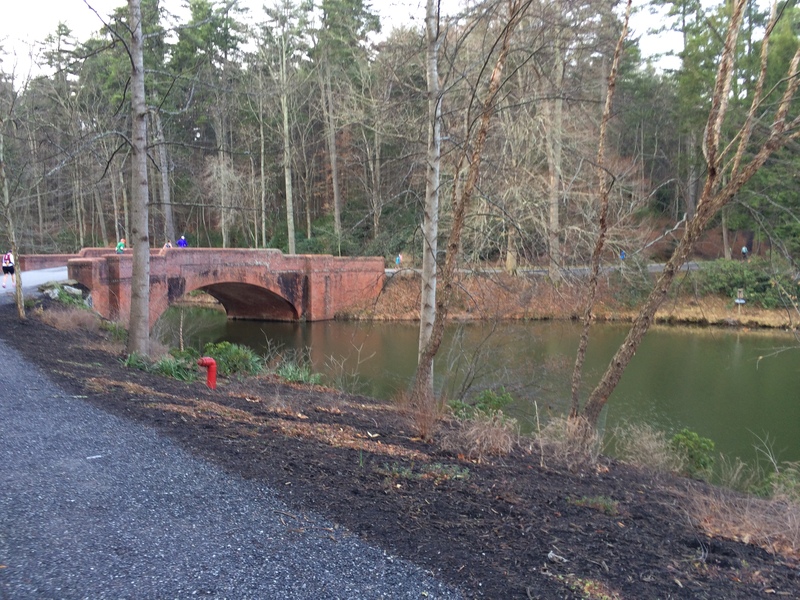 Soon after this bridge, the course became packed dirt and we ran in between a river and an open field and the wind picked up and the sun went behind the clouds and I was glad to put my gloves back on! It wasn’t freezing, but just a little chilly. And I picked up a girl scout cookie at a water stop! 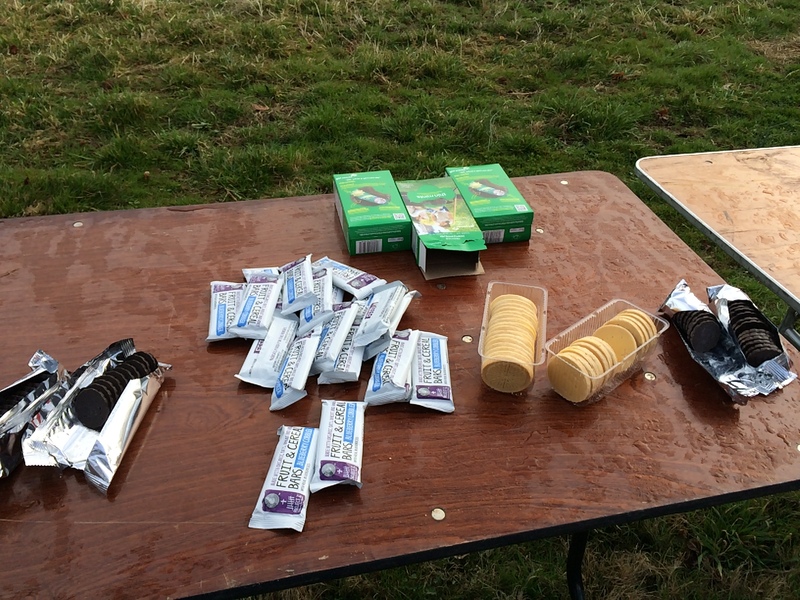 They had bananas, oranges, cookies, fruit bars, gu (lots and lots of gu), water, gu-brew and more. The fuel selection was better than any other race I’ve done! I did snag a thin mint (my first non-GU food of the day – I was too nervous to eat that morning). This is my last picture from the race because by mile 10, I was pretty much done. 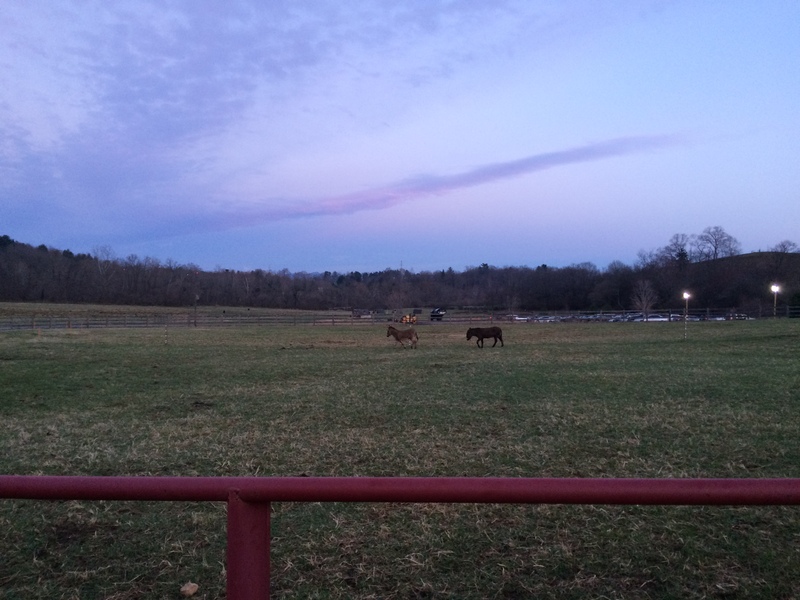 And right around then, we ran right past the parking lots. Where my car was parked. It was a tough mental challenge to keep on going and NOT to veer off to my car. But I kept going. And the last two miles were really tough. It was an out and back on a really rough dirt road with lots of rocks. Not easy on the feet, although it was pretty flat. I did more walking than I’d like to admit on that stretch. And while it was one mile out, that mile felt like three. When I finally saw the turn-around point, I did say (audibly!) “Thank you baby Jesus”. The mile back was still long, but felt like an actual mile instead of three! The final stretch was uphill. I NEVER walk in the final mile, but I sure did walk up that stupid hill! I managed to run across the finish line but my legs were just done. 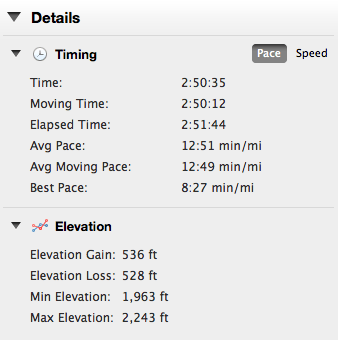 You can definitely see my pace drop at the end! 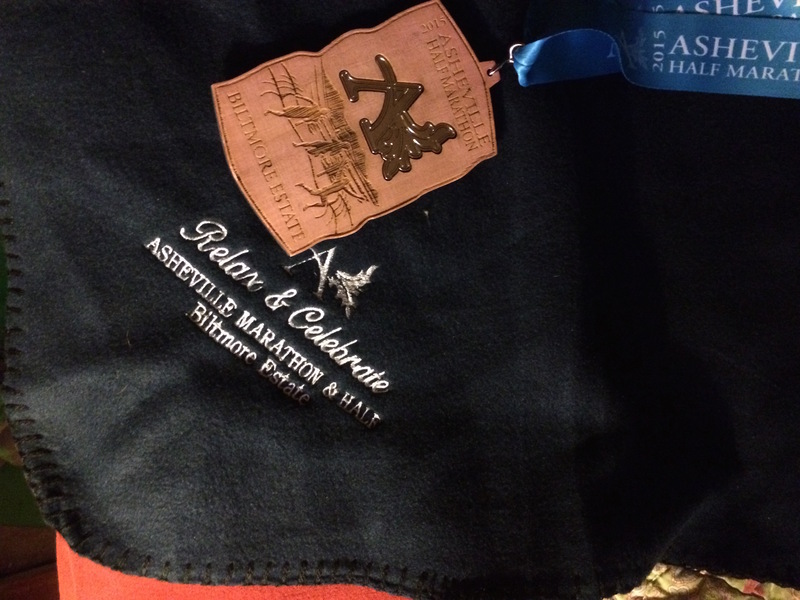 I was really happy to get the great fleece blanket at the finish and one of the volunteers handed me an opened bottle of water which was really nice! The medal is made of lightweight wood with a metallic inlay. The line was pretty long to pick up food at the finish party, so I just skipped it, went to my car to get my change of clothes (and wet wipes!) and went to the bathroom and changed into clean and dry clothes. So, what did I think overall? While 2,000 feet elevation isn’t really that high, I suspect for this sea-level-dweller that it did have an impact. The hills. I think with the proper training, these wouldn’t be too bad but they were tough on me for sure! My general preparation. Standing on my feet and not eating or hydrating the day before (because of working the expo) probably didn’t help. Not training for three weeks from having the Plague-2015 didn’t help for sure. Not eating that morning from nerves certainly didn’t help. Living eight-hours away from the race put some pressure on me (to finish in time to get on the road by 11am) and tired me out. If I run this race again, I’ll definitely plan to stay an extra night! The last out and back is tough mentally and physically. Saving the non-public part of the grounds just for the full. 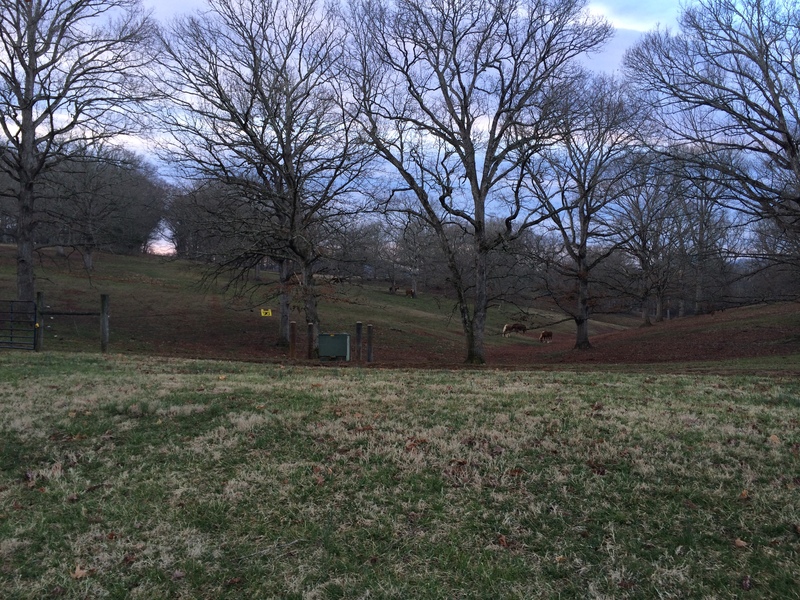 I’d love to get to explore that side (the wild side) of the grounds, but it’ll be years (if ever) before I’m ready for a full that includes hills. Spectators have to purchase tickets. I completely understand why this is necessary (otherwise there’d be a lot of “spectators” who just use the race as an excuse to visit the grounds for free!) but it is tough on families and friends who want to come cheer runners on. The location. 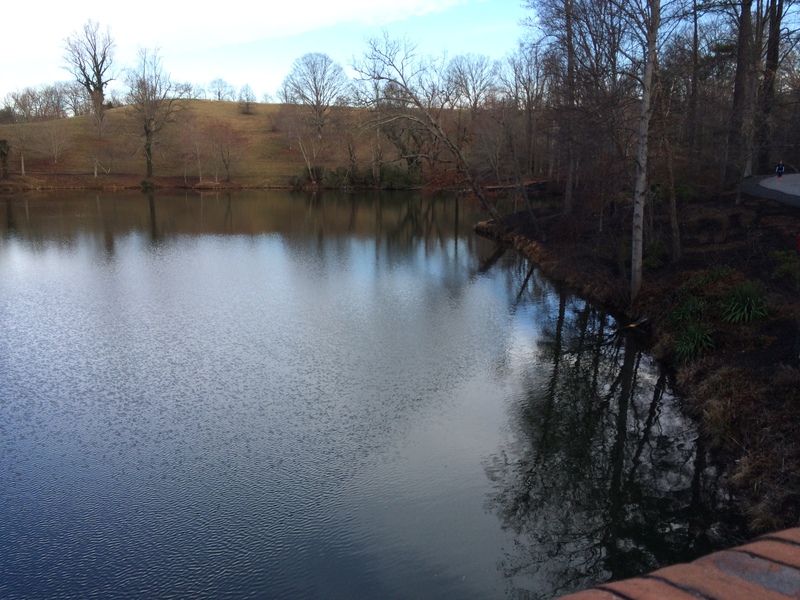 Asheville, the Biltmore house and the grounds are all just gorgeous. I could wander those paths and gardens for days. The weather. The weather was just perfect! Cool but not cold. A nice breeze, cloudy and sunny mixed just right. The volunteers. I’ve never experienced more enthusiastic and amazing volunteers! There were several along the course jumping and dancing for hours! The volunteers working the water stops were so encouraging and helpful. Every single volunteer was full of energy and was so supportive! The size. The race had less than 1,300 finishers. That meant the course wasn’t crowded but also wasn’t empty. While I was worried I was going to be last, there were still over 300 half marathoners who finished behind me. The size seemed just perfect to me. The logistics. The host hotels have shuttles (which require ticket purchase) that seemed to be lined up ready to go! Parking was plentiful and easy. The swag. While the medal wasn’t overwhelming, it was unique. And the lovely fleece blanket and buff were really nice touches. If this race was less than three hours away, I’d sign up to do it every year. About 30 minutes after finishing the race, I got back in the car and drove forever to get home. Luckily the traffic wasn’t bad going home and there was no bad weather to deal with either. But I was so ready to just be home that I didn’t stop for lunch or dinner, I just ate cheese puffs and drank diet mountain dew (isn’t that the ideal post-race meal?) and kept heading south! I got home around 7pm and was so happy to get out of that car! 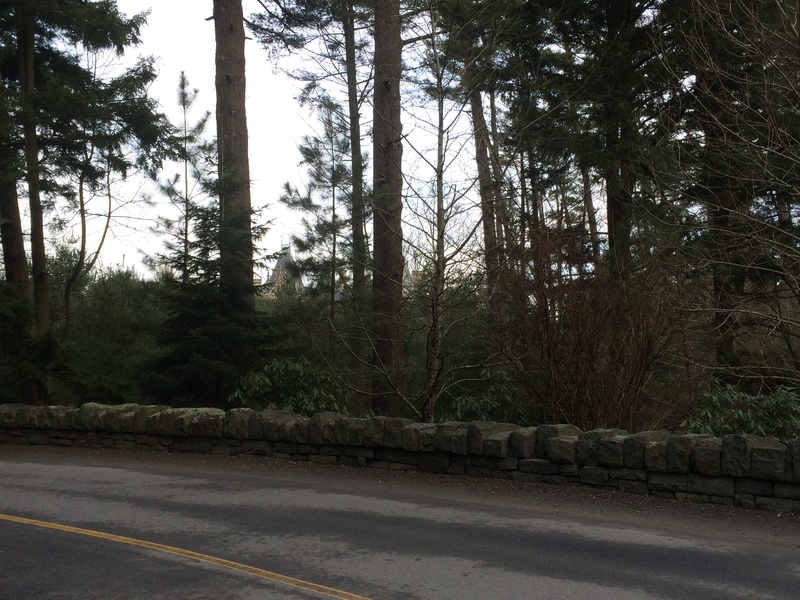 The distance (and very unpredictable weather!) means I probably won’t be doing it again soon. If they ever change the course so that the half gets to explore the wild side or if I become an experienced marathoner then I’ll be back for sure! It was TOUGH both mentally and physically, but it was gorgeous. 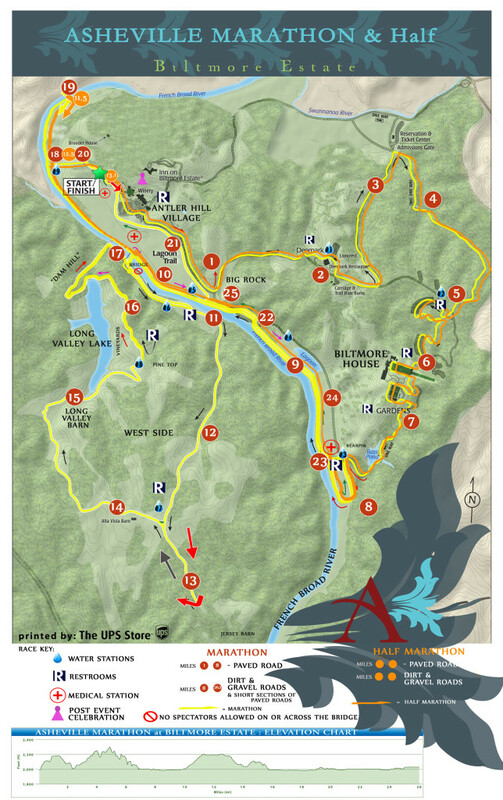 A well run race with really friendly runners and wonderful volunteers in one of the most beautiful locations I’ve ever seen. Definitely consider adding it to your race list! Disclosure: I was a race ambassador for the race and received a free entry to the race and 1/2 of a free hotel room for one night and some race merchandise. I was not compensated for this post and all opinions (as always) are my own.